I’m in the process of preparing the meal layout for Thanksgiving and I will be using my WSM- Weber Smokey Mountain Cooker. I plan on using the smoker to cook (2) turkeys in the WSM and perhaps another additional in the oven. We have several fruit orchards nearby and now is the season that they cut and burn a lot of their trimmed trees. I have A LOT of Apricot and Cherry wood that I was given so I plan on using that for my smoke wood. The virtualweberbullet.com site has been a source of great advice, answers, and a ton of pics that help the owner of the Weber Smokey Mountain cooker and BBQ enthusiast alike. I have noticed quite a lot of traffic to my posts regarding the cooks I’ve done with the WSM and wanted to point out that the above site has opened their specific Thanksgiving TURKEY related section. All BBQ enthusiasts are welcome! I’ll be adding my pics of the two turkeys later this weekend. It can’t be any easier to smoke the birds with the WSM. You basically add your charcoal or lump with your choice of smoking wood (apple, apricot, cherry, hickory, etc) then depending on your desire for a slow cook at 240º-260º or you can go much higher like 350º+ and with a probe thermometer you have an excellent turkey in approx 2.5 – 5hours that will rival any Turkey you’ve eaten. You can get as fancy or as simple as you’d like with brining and injection but it’s not necessary. Take a look at the virtualweberbullet.com site for pics of some fantastic Thanksgiving Turkeys. I’ll post my BBQ later in the weekend! 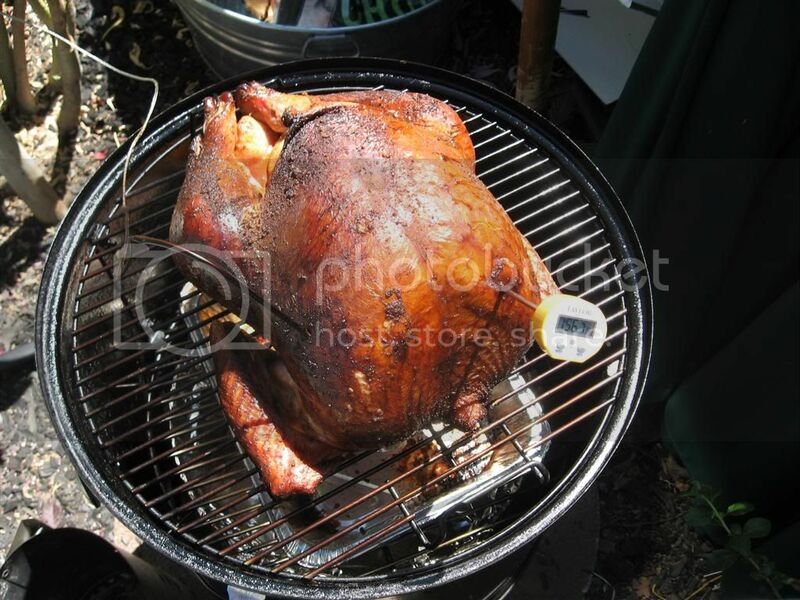 This entry was posted in BBQ and tagged BBQ, food, smoker, turkey, Weber, WSM on November 20, 2008 by Jasonweb.